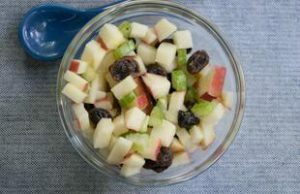 For this delectable and simple seasonal salad, combine diced apples and celery with raisins and nuts. Add dressing and enjoy! 1. Mix orange juice with salad dressing or mayonnaise. 2. Toss apples, celery, raisins and nuts with the dressing mixture. Posted in Recipes. This entry was tagged apple, diet, health, healthy, nutrition, recipe, recipes. Bookmark the permalink.